United Tool and Fastener  is pleased to announce the arrival of its first shipments of the new KASK  safety helmets. “These KASK safety helmets are the future, and we are excited to be the first to carry them,” UTF owner, Bobby Williams, said. 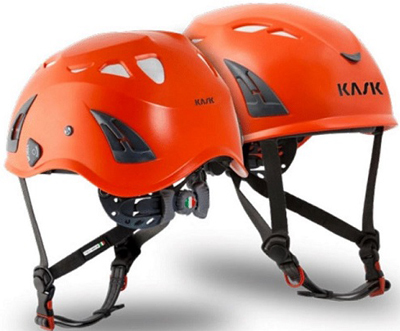 The KASK safety hats/helmets  are unique because of the advanced technology built into each product. Workers who wear the KASK safety helmets enjoy maximum ventilation in various climates from 10 air intakes and multiple outflow channels, which guarantee effective breathability. An antibacterial Sanitized® treatment acts as an internal deodorant, thus counteracting the development of unpleasant odors. The antibacterial treatment effectively prevents bacterial proliferation and increases fabric comfort. Furthermore, the helmet comprises 2DRY, a high-tech fabric that dries extremely quickly, enabling workers to remain comfortable by encouraging the expansion and dispersion of moisture to the outside air. “What makes KASK  safety helmets different? KASK safety helmets provide greater protection to workers at an overall/long-term lower cost and comprise a variety of safety protection for lateral, frontal and rear impact,” said KASK representative Jason Cashmore. “The KASK helmet foam is what absorbs the (impact) energy, which is what ends up doing the damage (to a worker in an accident),” Cashmore explained. • A KASK  helmet is OSHA-compliant for 10 years. • Most standard safety helmets have a one-year shelf life because OSHA requires the ratcheting mechanism to be replaced every year and at year six, a new helmet must be bought. • Total Cost of Ownership (which no-one looks at unless there is an accident) of a KASK  helmet is lower than other hard hats (KASK is approximately $130 versus a standard hard hat of approximately $190). If there is an accident, OSHA examines the helmet (including ratcheting compliance) and fines the contractor ($7,000) for being out of compliance if there is not proof of ratcheting compliance. • Anti-intrusion grille: air intakes are equipped with an anti-intrusion grille that prevents debris entry while maintaining breathability. • Extremely strong lamp clips on the helmets made of high-intensity resin and a frontal anti-slide insert that is compatible with all headlamps with elastic bands on the market. To buy or learn more about KASK safety helmets , contact any United Tool and Fastener showroom in Houston at 713-692-2323 ; in San Antonio at 210-495-8665 ; or in College Station at 979-731-8665 .